The Sensex fell over 188 points to close at 37,663, tracking weak global cues on concerns over Turkey's financial crisis amid sustained foreign fund outflows. The rupee stoked more worries, slumping to an all-time low of 70.40 per dollar (intra-day). Sentiment took a hit after the country's trade deficit soared to a near five-year high of $18 billion in July. The trade data was released by the Commerce Ministry on Tuesday after market hours. 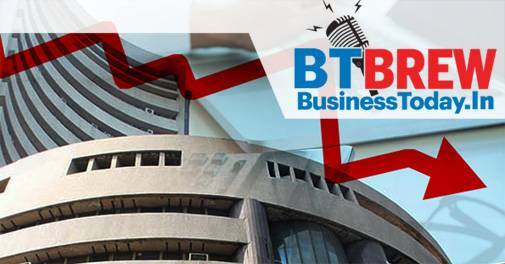 After opening lower at 37,796, the 30-share Sensex slipped further to touch a low of 37,634, but a rally in Infosys, Sun Pharma and Tata Motors helped it to recover. The NSE Nifty traded in the red for the major part of the session and fell below the 11,400-mark to hit a low of 11,366.25. It later recovered a bit to finish at 11,385, showing a loss of 50 points, or 0.44 per cent. Top Sensex gainers were Sun Pharma (2.98%), Bharti Airtel (1.51%) and Infosys (1.17%). Top Sensex losers were Kotak Mahindra Bank (3.62%), Vedanta (3.05%) and HDFC (2.61%). Weak leads from other Asian bourses following Turkey's currency crisis and fears of an economic slowdown in China affected sentiment on Dalal Street, brokers said.